On Wednesday January 23 at approximately 4:40 AM. The Orangetown Police Department arrested Stephen Summers, 53, of Glen Rock, NJ for Driving While Ability Impaired by Drugs. Officers responded to a report of a vehicle that crashed into a house at 461 Western Highway in Orangeburg and found a black Nissan had crashed into the front porch of the home. Both the car and house involved suffered extensive damage. Officers identified Mr. Summers as the driver of the vehicle and determined that he was operating the vehicle while under the influence of drugs. Mr. Summers was taken to Nyack Hospital for a medical evaluation where he was consented to a blood test to determine the drug content of his blood. Summers was charged with the misdemeanor of Driving While Under the Influence of Drugs. Summers is due to answer the charge in court on Feb 19. On Tuesday January 22 at approximately 12:15 P.M. the Orangetown Police Department arrested Kristen M. Welsh, 36, of Nyack for Criminal Mischief and Unlawful Possession of Marijuana. Officers responded to a report of an altercation between Welsh and another person at 36 South Broadway in Nyack. Officers observed the window to the back door and a window in an adjoining apartment were both shattered from the outside. An investigation revealed Wlsh had broken the windows after a verbal argument with a tenant of the building. Welsh was arrested and taken to OPD Headquarters. Welsh was arrested and taken to OPD Headquarters. She was also found to be in possession of 5 small clear ziplock bags of alleged marijuana and one marijuana smoking device. Welsh was charged with Crimal Mischief 4th, , a misdemeanor, and Unlawful Possession of Marijuana, a violation. Welsh is due to answer the charges in Nyack Court on February 19. 64 Medical Emergencies, Plus an Additional 91 Dispatched for Other Agencies. There were 34 arrests for charges including Unlawful Possession of Marihuana, Harassment, Petit Larceny, Criminal Contempt, Driving While Intoxicated, Grand larceny, Criminal Possession of Stolen Property, Criminal Possession of a Controlled Substance, Endangering the Welfare of a Child, Warrant Arrests, and Vehicle and Traffic Offenses. On Jan 31 Haverstraw Police Department announced they are investigating an incident that occurred in Thiells, NY on December 4, 2018. We are attempting to identify the below pictured individual and the owner of the below pictured vehicle. Anyone with information is asked to please contact our department at 845-354-1500 or by email at TIPS@Haverstrawpolice.org. 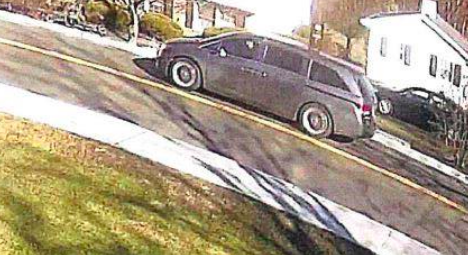 The vehicle appears to be a gray Honda Odyssey with aftermarket wheels and front tinted windows. On Jan 30 Haverstraw Police Department announced along with the United States Marshal Service are offering a combined reward of $10,000 in addition to the FBI’s $20,000 reward for the arrest and conviction of Eugene Palmer. Eugene Palmer is wanted for allegedly shooting and killing his daughter-in-law, Tammy Palmer, on September 24, 2012. Anyone with information is asked to contact Detective Cruger or Det. Sgt. Lutz at 845-354-1500. Information can also be forwarded to the United States Marshall Service or FBI. The total reward for information relating to the arrest and conviction of Eugene Palmer is $30,000.